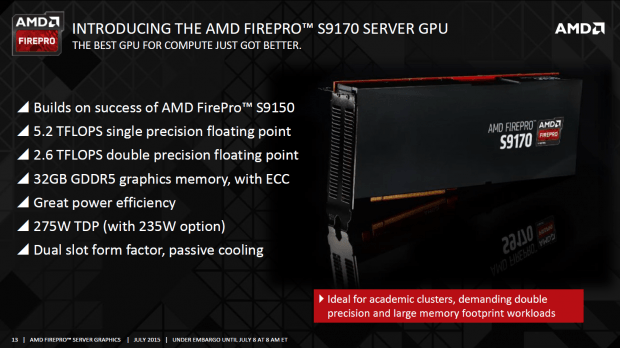 AMD just launched a new FirePro for professionals. The new FirePro S9170 is the successor of FirePro S9150. The main addition is Grenada XT GPU with 32GB of GDDR5, and is aimed at DGEMM (Dense General Matrix) and sever workloads, with OpenCL 2.0 support to boot. Other spec is 2816 stream processors clocked at 930MHz with 44 compute engines, 64 ROPs,176 TMUs, and 32GB GDDR5 memory clocked at 5GHz, 512-bit memory bus resulting in 320GB/sec of available memory bandwidth. FP64/FP32 compute performance sits at 2.62 and 5.24 TFlops.